The cost of imported goods rose at an annualized rate of almost 30% during April of 2011, following a 36% (annualized) rate of inflation in March. This inflationary shock is hitting US consumers hard. Because there has been no accompanying average rise in income, this means that average standards of living are already beginning what could become a potentially rapid descent. This predictable inflationary shock is the true cost of enormous US government budget deficits and irresponsible monetary creation policies by the Federal Reserve. The falling dollar has led to rising import costs, meaning the deficits are being paid for not by taxes, but by reducing the value of the savings of Americans as well as the buying power of their income. To survive this devastation, our best chance is to stop doing what financial "authority" tells us to do, and instead change our generational profile so that inflation redistributes wealth to us instead of away from us. The graph below presents the latest US Bureau of Labor Statistics for the cost of imported goods to the United States. 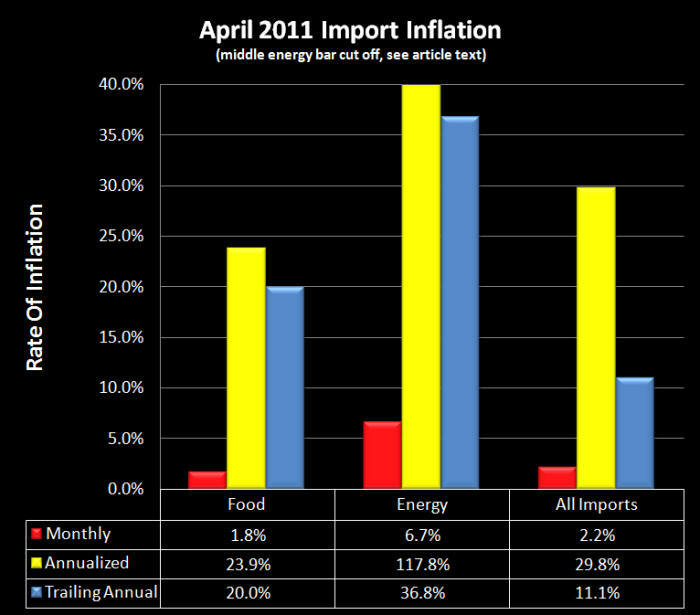 In each category, the red bar represents how much prices rose during the month of April 2011; the yellow bar represents what would happen if that monthly inflation rate were to continue for the next year (the annualized rate); and the blue bar shows the "trailing" year on year inflation impact, in other words the change in the cost of goods in each category between April 2010 and April 2011. While one needs to be cautious about drawing conclusions from single month inflation rates due to fluctuations - when our annualized rate is higher than our trailing rate, particularly when this occurs across multiple categories, that can be a sign that the rate of inflation itself is rising at an accelerating rate. Let's begin by looking at the cost of imported food. The monthly rate of inflation was 1.8% for April of 2011, meaning food purchased from outside the United States rose in cost by about 1.8%. If we annualize that monthly inflation rate it becomes 24%, and this is quite compatible with the trailing annual rate of inflation (last 12 months) of 20%. When we look at the cost of putting imported food on our table, both the trailing and the most current numbers indicate a very high rate of inflation on imported foods sold in grocery stores and restaurants. The cost of energy rose by 6.7% in the month of April. (We'll ignore the 118% annualized rate as an outlier.) When we look at year on year and compare April 2011 to April 2010, there has been a 37% increase in the cost of imported energy. Of course April's single month energy numbers have been offset by the plunge in commodity prices in general, and by the plunge in oil prices in particular that occurred the first half of May. That notwithstanding, however, over the last 12 months the cost of energy in US dollar terms has risen at quite a high rate, and the roughly $4 dollar a gallon gasoline took a good chunk out of all of our wallets the last time each of us in the US refilled our tanks. The cost of imports in general rose 2.2% in April of 2011, following a 2.6% rise in March. Our trailing 12 month average rate is 11% for all US imports. If we annualize the April numbers, then import inflation is rising at an annual rate of about 30% per year, and if we annualize the March monthly figures the rate is about 36% per year. When we put the numbers together it becomes plain that import-driven inflation is rising fast right now, and potentially accelerating. This is not unexpected, but rather has always been the eventual price of fantastic federal government deficits and seemingly unlimited direct monetary creation by the Federal Reserve to cover those deficits. As described in my article "Hiding A Depression: How The US Government Does It", the US remains in a real state of depression, with Great Depression-level unemployment levels when we add up: 1) the official headline U3 rate of unemployment; 2) the long-term discouraged unemployed and involuntary part time workers as captured in the U6 measure; and 3) the portion of the US economy that is being funded by the government's spending money it doesn't have. The US has been unable to grow out of this depression in real terms, and among the largest reasons has been that the value of the dollar has been too high. For many years the US standard of living as a nation has relied upon a "strong dollar" policy, where the dollar had a high value relative to other currencies. Because the dollar was high, the price of goods that we consume from abroad was artificially subsidized for us. And because the dollar was high, our exporters lost global competitiveness, our domestic manufacturing industries could no longer keep up with external competition, and the big box stores became predominately filled with goods made in other countries. In other words, in exchange for selling out the heart of our real economy, we enjoyed a temporary and artificial boost to our national standard of living. But now, unfortunately, the time has come to pay the piper. To boost employment levels and fundamentally improve the competitiveness of US workers and companies, last fall the US government began a campaign to drive down the value of the dollar relative to other currencies. The so-called QE2, or 2nd round of quantitative easing, was a slap in the face to the other nations around the world, effectively saying to them the value of US dollars is going to fall and there's not much you can do about it. The campaign has been quite "successful", as the US dollar has reached record lows on a trade-weighted basis versus the value of our trading partners currencies. Of course, as the goal of that policy was for the dollar to be worth much less than it used to be, this necessarily means we have to all pay significantly more for the imports that are coming in to this country. This surge in import inflation covered in this article is therefore not accidental, nor is it transitory - rather it is the necessary byproduct of deliberate government policy attempts to raise real US employment rates. What is currently happening is an example of exogenous supply shock inflation ("exogenous" meaning the inflationary forces are coming in from outside the domestic economy), a well established and powerful inflationary force which deflationist theorists often don't take into consideration. When the value of a currency plunges as has been happening with the dollar, and we have an import-driven society that can neither produce nor pay for what it consumes, then the falling dollar means we must use more dollars to pay other nations for the imports. Naturally, the cost of those imports begins to soar inside the US, and this sets off an immediate and pervasive round of inflation for the nation. This import-driven inflation can quickly become a pervasive determinant of daily life for an import-driven society. This inflationary surge is particularly damaging when wages are not increasing, and investors are not being paid anything even remotely close to a fair market rate of interest for the inflationary situation. In other words - the present situation. When the cost of maintaining an average standard of living is rising fast, but the average income coming in is not rising, then this translates very directly into a reduced standard of living for the average American person. I've been explaining what would be happening and the impact for consumers for some time now, and one example for this specific topic is an article (with an accompanying video) which I published in the fall of 2009, titled "Inflation Supply Shock Inferno". The article and video are good resources for understanding what is occurring right now and what may be happening over the next few months. The article should also help make clear why the current situation was not only predictable but near inevitable, given the government's decisions since 2008 and before. This kind of knowledge if vital if you are going to take action to protect yourself. There is another problem here that is very much intertwined with government policy, with the massive federal budget deficits, and with the massive direct creation of money out of thin air by the Federal Reserve. What this all adds up to is that the generational redistribution of wealth within the United States is already well underway. As inflation continues to mount and becomes increasingly undeniable, then younger workers, people who have most of their careers ahead of them, will demand substantially higher prices for the services they provide. And although this ability to increase wages is going to be limited by the depressed state of the economy, at least in many sectors, overall these workers are going to succeed in at least partially keeping up with inflation over their remaining decades in the work force. Higher import prices mean fewer import purchases, given strictly limited financial resources for many consumers, and if we have less imported goods available for consumption for the US as a whole, that means there is a lower standard of living on average. The numbers have to add up, and if one group is at least partially keeping up, that means there's another group that isn't, and it's those people who are going to feel the disproportionate drop in their standard of living. Those people who will be on the losing end are for the most part older Americans: older workers, older savers, older investors, and current retirees. They simply don't have the ability to bring in another lifetime's worth of wages and income, and they are not receiving yields on their investments that will offset the negative effects of inflation on a pretax basis, let alone an after-tax basis. I wrote the article linked below, "Bullets In the Back: How Boomers & Retirees Will Become Bailout, Stimulus and Currency War Casualities", to examine in depth the ignored but vitally important generational results of US government policy and Federal Reserve policy. When we add up the massive deficits, the direct creation of trillions of dollars out of thin air, and currency strategies that involve driving up the cost of imports, the combined effects can be compared to the government taking tens of millions of older Americans, lining them up in a row and systematically machine gunning them in the back. The phrase "machine gunning in the back" may seem extreme and over the top, and I've gotten some pushback on that phrasing. The provocative language is entirely appropriate however (in my opinion), when we consider the lack of a national dialogue about a deliberate government induced redistribution of wealth that will likely reduce the standard of living for tens of millions of people over a period of decades. We are talking about a nation whose standard of living is based on imports, and the cost of those imports are increasing for people across the board at an average annual rate in excess of 10%, with an acceleration to 30%+ in recent months - and that is a situation which demands strong language. Particularly when incomes are not rising in synch, which then necessarily means standards of living are falling for many millions of people. If your income isn't rising now and is not likely to be keeping up with inflation in the future, then every time you go to the grocery store and you pay 20% more for a food item - you are taking a bullet in the back to pay for federal government policy. When you go to the gas pump and you pay 37% more than you did a year ago, then you are taking another bullet in the back to help pay for irresponsible deficits and monetization. Any time you buy something made from outside the United States, and costs are climbing at an annualized rate now about 30% every year, you're taking bullet in the back with that purchase, followed by another, and another. Each of these is hitting you directly in your standard of living, this is far from accidental, and the situation is just likely to get worse. The simple solution is to pull all you can out of paper investments and symbolic currencies, put them in the gold, and hunker down to survive the still coming crisis. Unfortunately, however, we live in a complex and deeply unfair world, that makes mincemeat of emotional reactions and simple solutions. As illustrated in step-by-step, easy to understand – but irrefutable – detail in the article "Hidden Gold Taxes: The Secret Weapon Of Bankrupt Governments" linked below, a simple solution of just buying gold leaves you handing a good chunk or perhaps most of your starting net worth over to the government by the time all is said and done. The way the government – under existing laws – effectively confiscates the wealth of gold investors in a highly inflationary environment is little understood by most gold investors, but should form the central point for their investment strategies. Let me suggest an alternative approach, which is to study, learn and reposition. Almost all financial and economic articles that you see today are really about the upcoming re-distribution of wealth, whether those words are used in the article or not. To have a chance, you must learn not just how wealth will redistribute, but how unfair government tax policies (that can be relied upon to increase in unfairness) will cripple most simple methods of attempting to survive inflation. Then, yes – buying gold (and perhaps a lot of it) can be one key component of a portfolio approach, as discussed in my Gold Out-Of-The-Box DVD set. Use multiple components, each doing what they do best, shift the components in a dynamic strategy over time, and position yourself so that wealth will be redistributed to you in a manner that reverses the effects of government tax policy. So that instead of paying real taxes on illusionary income, you're paying illusory taxes on real income. And the higher the rate of inflation and the more outrageous the government actions – the more your after-inflation and after-tax net worth grows.